Neon pastel sunsets communing with the ocean, crystal shops, flower fields, migrant farm workers, flea markets with Shiva printed onto blankets, sharp bluffs that watch over the surf below, sunlight touching everything - a sanctuary of strange splendor. 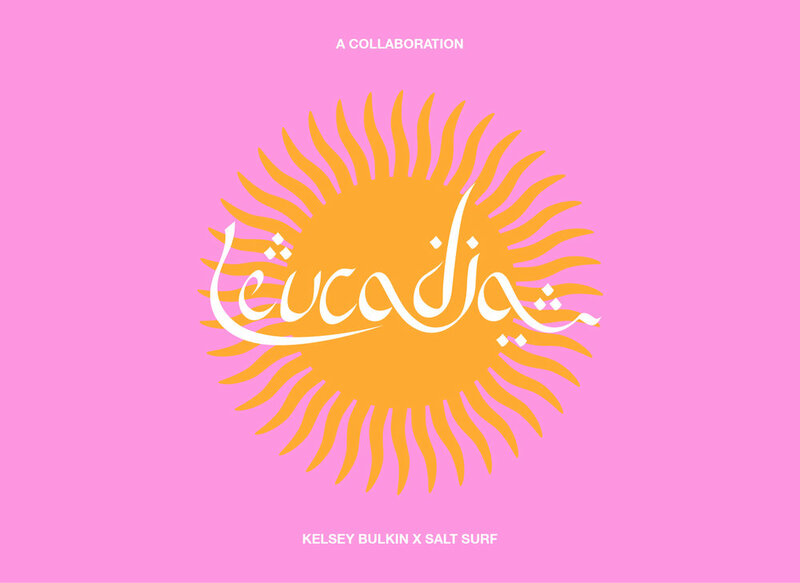 From this place comes a collaborative collection between musician Kelsey Bulkin and SALT SURF titled LEUCADIA. Leucadia, CA is a small surf mecca on the coast of north county San Diego wedged between the ocean and suburbia. A fusion of surf culture and new age kitsch, Leucadia is where Kelsey and Nabil (owner of SALT SURF) met as kids in the mid 90s and where the inspiration behind this collaborative collection came from. The first piece, a sweatshirt with embroidered english text drawn as Persian calligraphy is an homage to Nabil’s heritage as a first generation American whose family immigrated to California from Iran. This piece also reflects the new age spirituality which was often prevalent in the coastal town, which often drew inspiration from Middle Eastern culture. It features black embroidery on an athletic yellow sweatshirt. The first piece, the bright pink Infinite Waves tee, suggests a positive outlook bordering on naivety or nirvana depending how you look at it. The bright pink t-shirt features a heavily printed orange sun graphic that reads INFINITE WAVES across it. The third piece in the collaboration is a particularly special piece to both Kelsey and Nabil. They are both members of the Baha’i Faith, and the Mankind is One collab, is actually a recreation of an old Baha’i shirt the two both owned as children. It features the phrase “Mankind is One” written in six different languages (Arabic, English, Spanish, Chinese, Hawaiian and Hindi). Simple in its message, it is a reminder that we are all one. The shirt was a favorite that the two would wear as kids during race-unity day parades. They couldn’t seem to find the shirt anymore, so they decided to recreate it.